A tweet said it all. 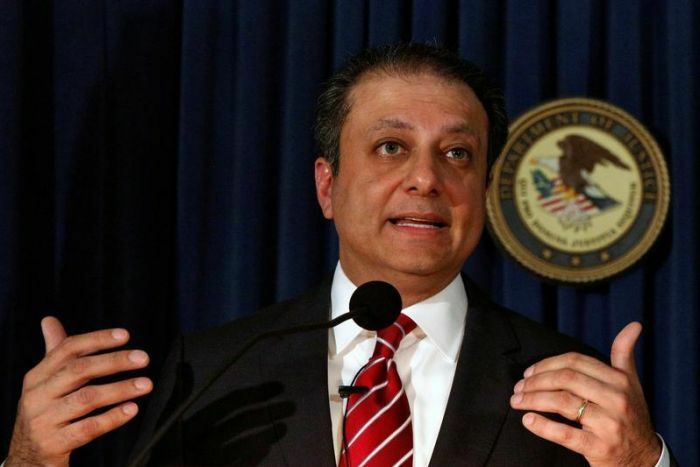 Preet Bharara, the Manhattan based United States Federal prosecutor also happens to be the highest ranking law enforcement officer amongst the Indian Americans. (In)famous amongst Indians, for prosecuting his own ilk, Rajat Gupta, the once iconic and now disgraced Indian American corporate, Preet Bharara tweeted of his being fired today, after it became widely known a few hours earlier that he did not intend to step down despite Attorney General Jeff Sessions’ request that leftover appointees of former President Barack Obama should quit. PREET BHARARA, the name is not new to the huge indian diaspora that now considers United States their home. As is common with most Indians who settled in America, the tag of having been an Indian once, often keeps haunting their sub conscious selves and manifests itself in many different ways. The loyalties of such Indian Americans have never been questioned, thanks to an amazing multi-plural and tolerant American society. However the over zealousness and the urge to score a few brownie points over their counterparts, often take such Indian Americans to act in a manner that draws ire from some quarters of the society and Preet Bharara was no exception. Preet Bharara invited extreme bitterness, from the Indian American community, particularly the older generation, for what they perceived as over enthusiastic Indian American going after their own with a vengeance. Rajat Gupta, the former chairman of Mckinsey and Company and a member of the Board of Directors of The Goldman Sachs Group Inc, and the Procter & Gamble Company, was sentenced for crimes stemming from his involvement in an insider trading scheme with his business partner and friend, Raj Rajaratnam, the founder and former head of the Galleon Group. Gupta was convicted on June 15, 2012, following a four-week jury trial that projected an aggressive Bharara upholding US Justice system over race, religion, caste or creed. It was watched with mixed feelings of pity, remorse, sympathy and bitterness from not only the Indian Americans but the entire Indian community back home who considered it as an American dream that went awry. At the peak of the trial, even the Obama administration had to distance itself as the perceptions of imparting justice weighed heavily over everything else that mattered. Infact, the world of an aggressive Ferozepur-born Preet Bharara, then 43, who immigrated to United States when he was barely 2 yrs old with his parents, grew to love baseball & ‘The Boss’ Bruce Springsteen from his native Monmouth County in New Jersey, differed markedly from a mature, cricket-loving Rajat Gupta, then 63, who came to the US all grown up to study at the Harvard Business School and then got ensconced in the elite suburbs of Connecticut? While Bharara did upset the Indian American community at large, but in the process he earned a reputation of being the most upright US prosecutor and a no-nonsense man. Now after having revealed of his being fired, The Justice Department late Saturday also confirmed Bharara was no longer the United States attorney. The current Deputy U.S. Attorney Joon H. Kim will serve as acting U.S. attorney in the interim. Bharara, once lauded on the cover of Time magazine as the man who is “busting Wall Street” after successfully prosecuting dozens of insider traders, has in recent years gone after over a dozen state officeholders, – including New York’s two most powerful lawmakers. Attorney General’s decision to include Bharara’s name on the list of 46 resignations of holdovers from the Obama administration surprised Manhattan prosecutors. More so as Bharara had met Trump on Nov. 30, saying afterward that he had been asked to remain in the job. Robert Morgenthau, a Democratic U.S. attorney in Manhattan, famously held out for nearly a year after Republican President Richard Nixon’s 1969 inauguration, saying he needed to see some important cases through. He ultimately left in January 1970, after the White House declared he was being replaced and announced a nominee. New York Sen. Charles Schumer, a Democrat, said in a statement Friday that he was “troubled to learn” of the resignation demands, particularly of Bharara, since Trump called him in November and assured him that he wanted Bharara to remain in place. While a lot of hue and cry might have been raised over the firing, the fact remains that Donald Trump as the President of the United States has the absolute right to replace US Attorneys as he deems fit, actions that certainly, in his own words, will make America Great again.